..........for our own dear Crazy Bird, Miss Darnell! Lots of you will already know that Darnell wrote on her blog that she was having an operation last Tuesday. It's all gone well and she's no longer in fear of her 'baby basket' making a bid for freedom - as she so neatly described it! Here's hoping that Darnell is soon back to her usual bouncy self! 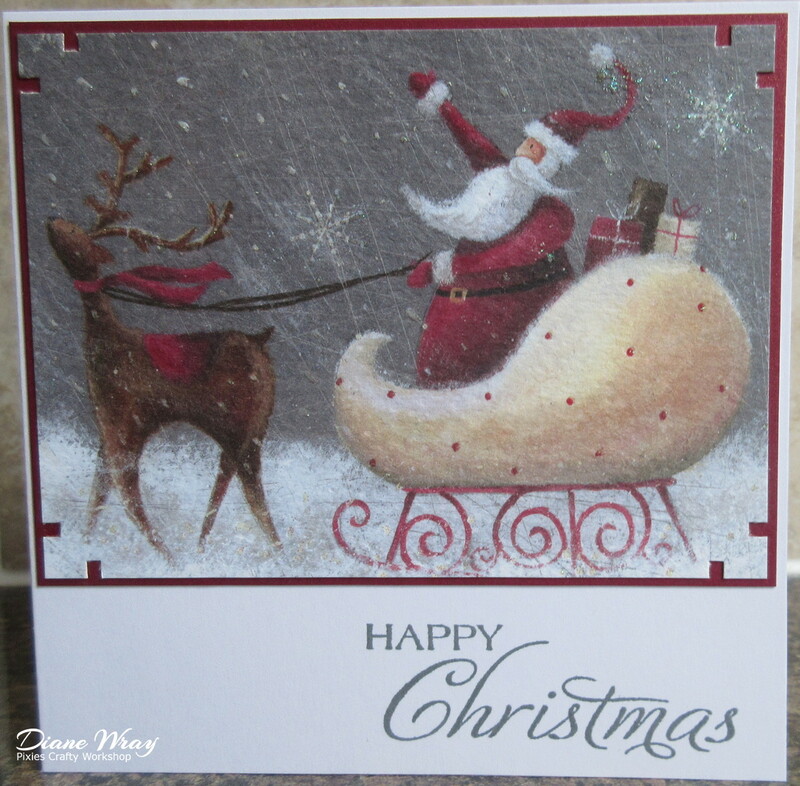 Here's my Christmas card for the June Rudolph Days challenge over at ScrappyMo's - phew, managing to join in part way through rather than a last minute sprint. Oh it's been a fun time here in Hampshire! At one point we had six fans running in the house when the heatwave was at its height! Phew - I love Summer, sunshine and hot weather but even that almost had me beat! 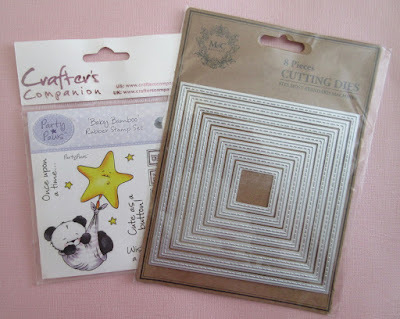 - image from the Crafters Companion 'Baby Bamboo' stamp set and Memento 'Tuxedo Black' ink - this adorable stamp set was a gift from Val some time ago, and it's a real joy to use! - cut out the 'BABY' letters and fixed them to the image panel using little thin sticky pad pieces - finished! I loved using this sweet set of stamps - all we need now is for someone to have a baby! And, of course the stitched square dies are such fun to use - there are eight in the set and the largest one is an impressive 'almost' 4.5" across! The Snippets Challenge will run for two weeks from now on and the Playground gates will close at 11am UK time on Saturday 8th July. The gates will open again at midnight UK time on the same day. It's still a maximum of ONE entry and please say in a comment if you wish to play and be a possible winner of the prize. The prize is all three items together as a single prize, unless you really do only want to try for a 'split' - in which case I'd do a further draw for the other item(s). Please also link back to the Playground in your blog post to be eligible for the draw. Remember, if you link into the Playground and don't say clearly that you're wanting to be in the draw then you will be bypassed if your name comes out of Mr Linky. I'm sure you all know I ask for a positive 'yes' just in case you're playing only for fun. Thanks! 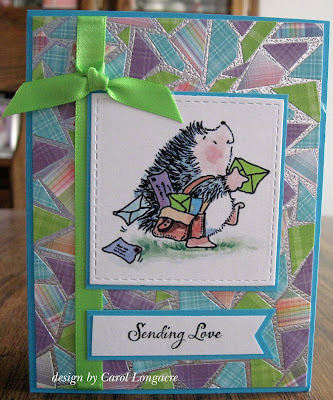 Be sure to call back next week to see the winner of last fortnight's prize (the Clearly Besotted 'elephant stamps and dies' and the Spellbinders Borderabilities dies) plus my picks from the past two weeks. Once again, it's the monthly Rudolph Days challenge over at ScrappyMo's. Time to make a Christmas card girls! Of course, another way would have been to just lightly run a pencil line around the frame inner as a guide - but OCD was lurking here! The card came with the gold stars already glittered, extra bonus. 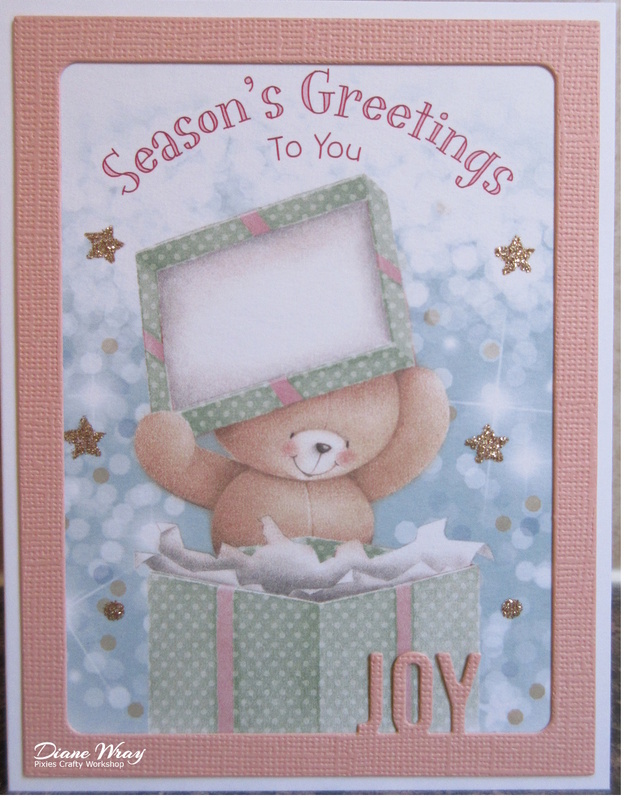 The colours are really non-traditional and, the white card blank I used is actually very slightly 'off-white'. I love really crisp, very white cards but I bought these on line and was quite disappointed when they arrived a while ago. But, they do have a use as a lot of commercially produced Christmas cards are printed on slightly off-white card - which makes for a good match when up cycling! Still think it's hard to beat Hobbycraft if you want to buy bright white card blanks - and their 'own brand' 300gsm own card stock is also great for making your own blanks too. Of course, my favourite Samuel Taylor also do brilliant white card stock in various weights as well - it's usually best to buy at craft shows for good deals though. - a snippet of white card onto which I stamped the old fashioned gramophone and sentiment using Memento 'Tuxedo Black' ink and stamps from a 'pre-loved' SU 'Timeless Talk' set - gosh the Misti was so useful for the solid black stamping! My card was made for my 'Uncle Frank's' recent Birthday, who along with his late wife Alice was my guardian when my parents left me at boarding school in Germany. This was so that, in case of emergency (medical or otherwise), they could step in and sign documents on behalf of my parents, who were back in the UK. No emails back then - in fact a telephone was a rarity! Hello again! Time for the fortnightly round up of the Playground which includes our latest Guest Designer, some 'picks' of the fortnight and of course the prize draw. As our Guest Designer this fortnight we have a lovely lady who did need a teensy bit of coaxing - our Val of 'Aquarius Blog' is so delightfully modest! I spotted a tutorial on Karen’s blog (http://snippets-karen.blogspot.co.uk/2017/05/swipe-your-credit-card.html) showing an interesting technique for using Distress Oxide inks and an old credit card. I was sent in the direction of this tutorial from Loll’s blog. 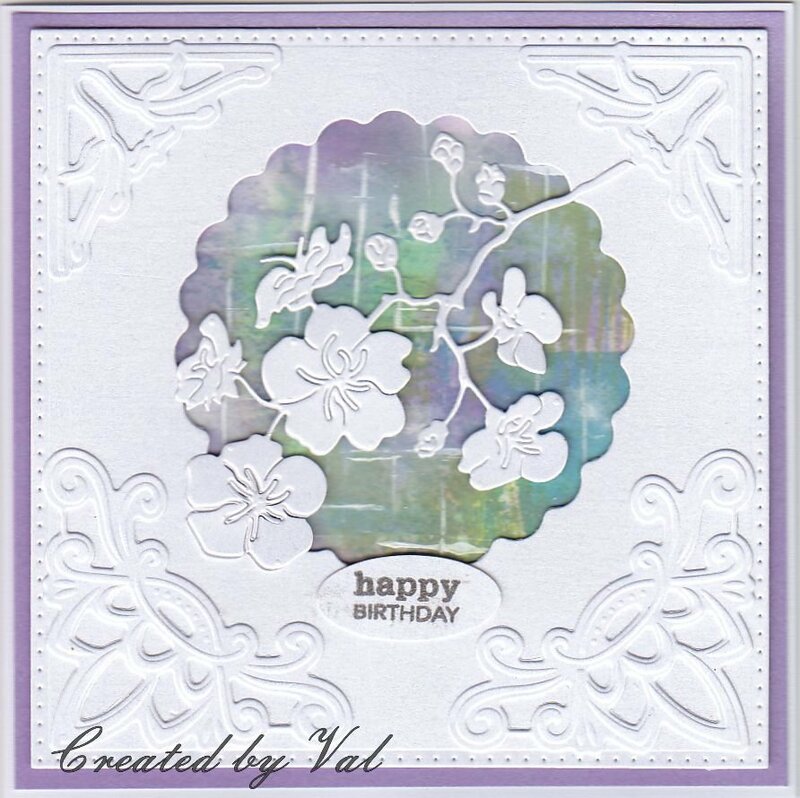 I coloured a fair sized piece of white card using this technique and I’ve used a left over snippet of it behind the window on my card and used various snippets of white Centura pearl card for the layers, corners and of course the blossom. Some time ago I acquired a supply of Centura card in the A3 size, originally for making boxes and of course this has left me with some quite sizeable snippets to use as well as the inevitable small bits which I can never bear to throw away. 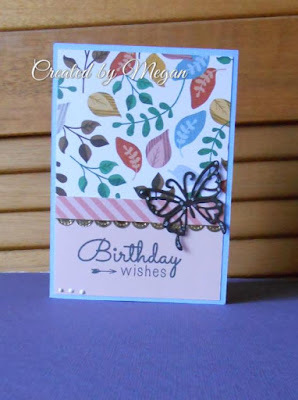 I suppose I’ve been making cards for about 15 years or so and thinking about it has made me realise just how much the equipment and availability of materials has moved on since then. My first die cutting machine was an original Sizzix which was tiny, red and worked on a sort of press/lever method and the dies were very simple shapes, quite small too. Any more intricate cutting was of necessity done with scissors – and patience!! We are so fortunate now to have so many resources at our fingertips to be able to produce professional results. I really enjoy the challenge of working with what I have, combining colours and techniques to produce unique cards – I doubt I’ve ever made the same card more than once and would just hate to work on bulk production. I’ve been blogging for some years but not sure quite how many – probably about eight. 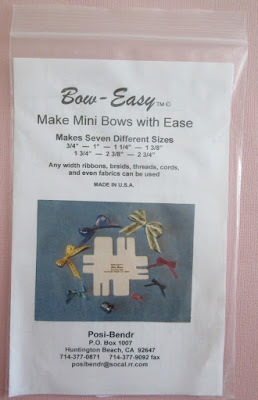 I’m always on the lookout for different techniques to try and of course blogland is a great source of inspiration as well as putting the ‘buy now’ temptation in front of us all. Thank you so much Val for agreeing to be our Guest Designer this fortnight. Val enters the Snippets Challenge every single time and her work is always such a delight. Just take a look at the snippets background on this adorable card girls! It absolutely blew me away - and so many of you commented how much you also loved the very clever technique of piecing snippets and then filling in the gaps with heat embossed EP. So creative, and just what we've come to expect from Carol L too - And, worthy of her second Gold Star I'm sure you all agree! Viv made this fabulous gift as a thank you for some people who kindly lent them the use of their static caravan down on the South Coast. It meant that Viv and her hubby could relax for a couple of days during a year of travelling so much as Bowls England President. How lovely to even include shells collected from the nearby beach! 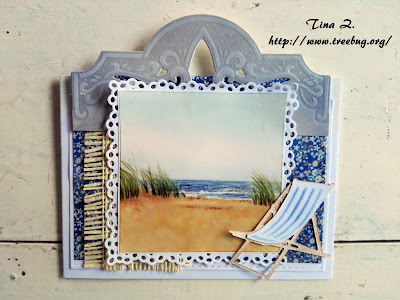 And Tina also made a beautiful beach scene - I love the inclusion of the hessian 'mat' and the deck chair. You feel as if you want to tuck your skirt into your knickers and go for a paddle! It's absolutely beautiful weather here as I'm typing this - let's hope that it's lovely and sunny when it publishes on Sunday. No doubt UK will go silly and everyone will be running around in little vest tops and shorts - and that's just the menfolk! That's my three picks - I do hope they will inspire you as well girls. Of course we had loads of fabulous ways to use up snippets, so I do recommend that you grab a cup of coffee (or iced tea even!) and spend some time visiting blogs - the thumbnails with links are always there for you to look back over. 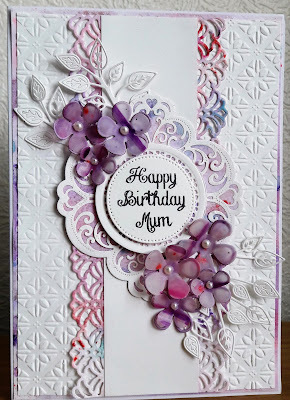 What a fabulous card, made by Maria of 'Ivy Leaf Crafts'. Welcome to the Snippets Playground Maria, and I do hope you return to play again soon. Well done Karen - can you please drop me an email with your address in and I'll post your prize off as soon as possible. My email address is on the right hand side bar. Keep those snippets entries coming girls, you still have a week left to play HERE remember! 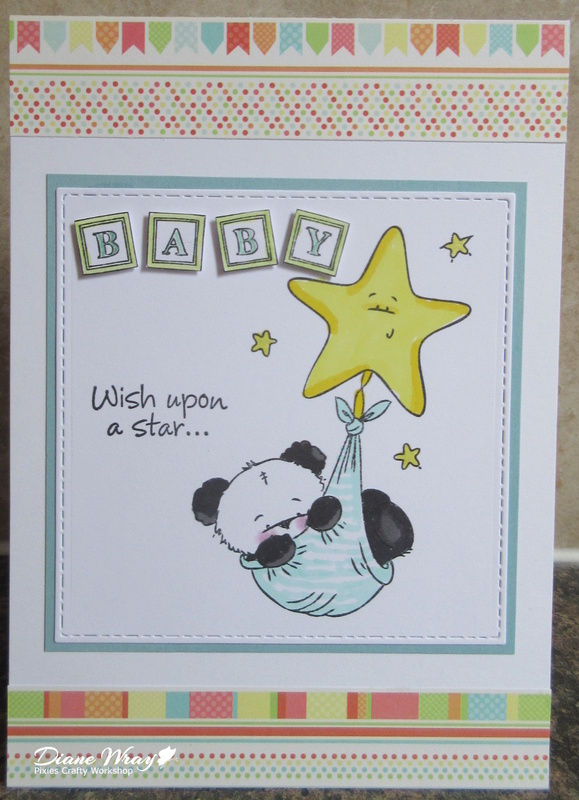 And the prize is a Spellbinders Spellbinders 'Borderabilities A2 - Curved Borders One' set and Clearly Besotted 'Baby Shower II' set of stamps with little matching dies. I will split the prize if you only want to play for the elephants or the border dies. That was it - done very quickly. I'd also like to enter this into the current challenge over at Penny Black and More for June where they're celebrating their 7th Birthday with 'Anything Goes'. Many congratulations ladies - and especially to Brenda who works so hard running several challenges. As always, a huge thank you to everyone who came to play this past fortnight - loads of gorgeous entries. 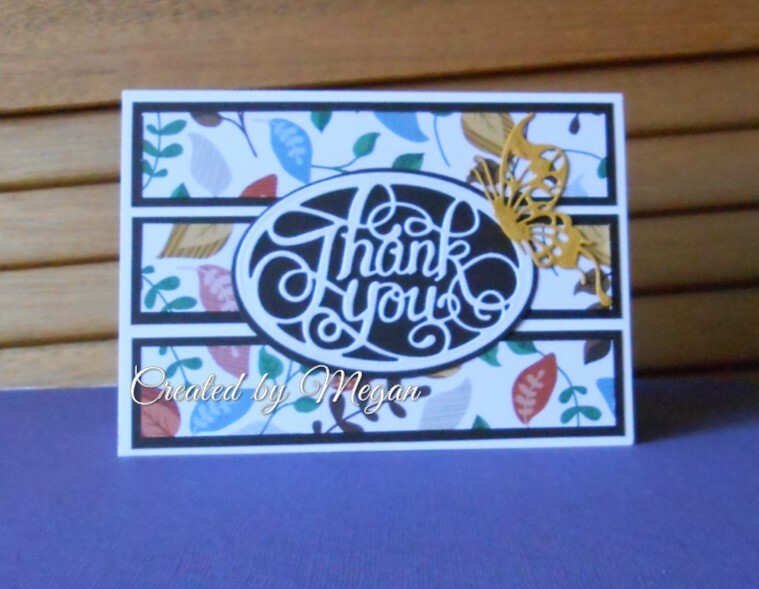 And a really massive thank you to Megan for her sterling work commenting as well. It was such a help - huge hugs from me Megan! - snippet of green card, die cut using one of the dies from the Spellbinders 'Borderabilities A2 - Curved Borders One' set. A set I'd kept forgetting I even had! The Clearly Besotted stamp set is a fairly recent acquisition - at last their store has re-opened after Stephanie took time out. To be honest I suspect she was plain exhausted - but I'm so glad they're up and running again with her sister at the helm. They have lots of new stock, sadly for us it's selling out fast too but these little elephants just called for me to buy them :) The set is perfect for baby shower cards but I think the 'Jumbo hugs' sentiment I used is nice and versatile - plus elephants can so easily be mixed and matched with other sentiment stamps. And of course the ears could have been contrasting colours - but this was my first play plus I was in a bit of a hurry so I didn't go too mad! As I said, I've badly neglected the Borderabilities dies - shame on me! A lot of people use them vertically down cards and the results can be fabulous. The prize is the Spellbinders Spellbinders 'Borderabilities A2 - Curved Borders One' set and Clearly Besotted 'Baby Shower II' set of stamps with little matching dies. I will split the Spellbinders and Clearly Besotted parts of the prize in two if you only wish to play for one or the other. The Snippets Challenge will run for two weeks from now on and the Playground gates will close at 11am UK time on Saturday 24th June. The gates will open again at midnight UK time on the same day. It's still a maximum of ONE entry and please say in a comment if you wish to play and be a possible winner of the prize. The prize is both items together as a single prize, unless you really do only want to try for a 'split' - in which case I'd do a further draw for the other item. Please also link back to the Playground in your blog post to be eligible for the draw. 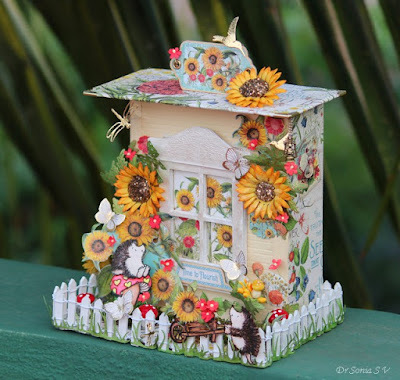 Be sure to call back next week to see the winner of last fortnight's prize (the Avery Elle dies and the W Plus 9 Doodlebuds stamps) plus my picks from the past two weeks - as well as another lovely guest designer too! I whipped up a further four Christmas cards, all the same, to keep up with the self-imposed target of 12 per month from the beginning of December through to the end of November. I'm now halfway there and managing to keep up - so far! - glued the image panel in place and left it at that - used cream and managed four layers, if you count the addition of the butterfly! This card is for Mrs A's current 'Butterfly Challenge' where the theme is 'L is for Layers and/or the colour Cream'. You have another two weeks to join in folks! I got back home safely yesterday but do need time to catch up on the Snippets Playground girls! 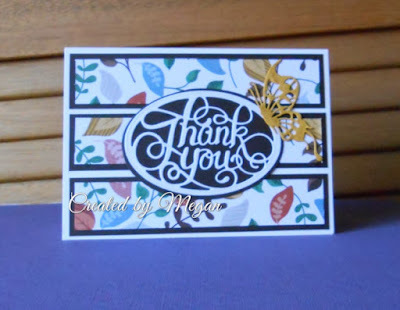 In my absence, Megan stepped forward as our current Guest Designer and offered to make sure she commented on your entries. Bless her heart, I've just begun hopping around your entries and she's been true to her word - thank you so much Megan! What a star. When I get time I'll pop some photos on a blog post with a couple of tales from recent events - believe me, there are some things at these reunion weekends you really couldn't make up! I have been trying to have a clean up of my desk and make use of the large volume of snippety bits currently holding a take over bid of my desk top, I found this strip of paper and decided to make two cards to use it up, I dug around in my box of snippets for some co-ordinating card to layer the bits on and came up with these two designs, I have also been trying out some of the super cheap dies I have bought online from China and I will not be accepting any responsibility for enabling any of you!!!! Something Megan says that's so true - snippets do make a bid to take over the place! Megan is a much more elusive creature than many of you are - despite really searching I can't find much out about her ..... so she shall remain a 'lady of mystery'. I do know that she's been blogging since January 2015, has quite a few wins for her designs, lives in Australia - and that's about it! No profile photo either. But, she's one very talented lady and I do think you should hop over to her blog for a closer look - and perhaps add yourself as a follower at the same time? Let's move onto my picks from this past fortnight - tough call as always! I say that every fortnight and it's so, so true! To be honest, each one of this fortnight's picks is worthy of a Gold Star, so ladies do feel free to pick up your badge from the RH sidebar! 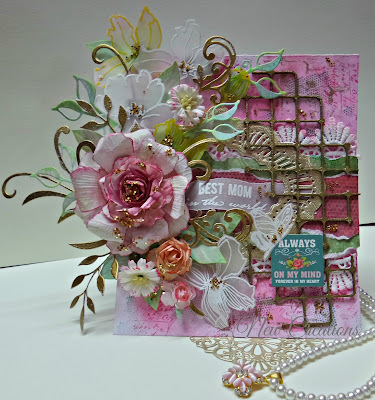 Vinita made this fabulous Mothers Day card - as I said on her blog, it's jaw-droppingly gorgeous! What a wonderful Mothers Day card - and so much fabulous detail as well. The huge pink rose she made for the front is stunning - and there's lots of detail about the whole process over on Vinita's blog too. 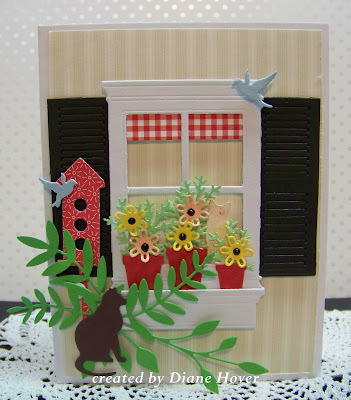 Diane H made this marvellous window scene - if you look closely there's even a little cat peeping out of the window! 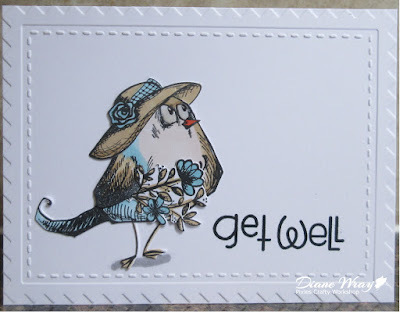 So cute and I do like the modern feel of this card. That's my three picks - I do hope they will inspire you as well girls. They're extremely detailed pieces of work, that's the 'theme' I homed in on this fortnight. Of course we had loads of fabulous ways to use up snippets, so I do recommend that you grab a cup of coffee and spend some time visiting blogs - the thumbnails with links are always there for you to look back over. What a fabulous card, made by Claire of 'String Bows'. Welcome to the Snippets Playground and I do hope you return to play again soon. Well done April - can you please drop me an email with your address in and I'll post your prize off as soon as possible once I return from my 'jollies'! As you're such a cat lover I think you'll be extra pleased with Mr Random! My email address is on the right hand side bar. Keep those snippets entries coming girls, you still have a week left to play HERE remember! And the prize is a W Plus 9 'Doodle Buds' stamps set and the Avery Elle 'Postage Elle-Ments' die set. - glued the sentiment partly onto the circle - finished! 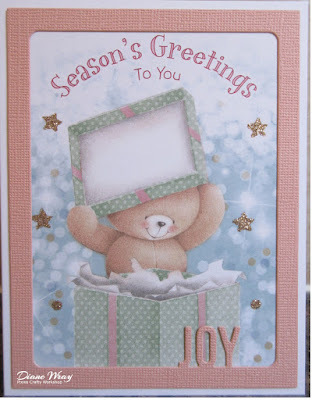 This card is so like the fresh cards that Kath Buckle makes - here. I love her style and am really pleased how this turned out! The stitched dies are brilliant - all thanks to my friend SaRn pointing us in the direction of The Works. 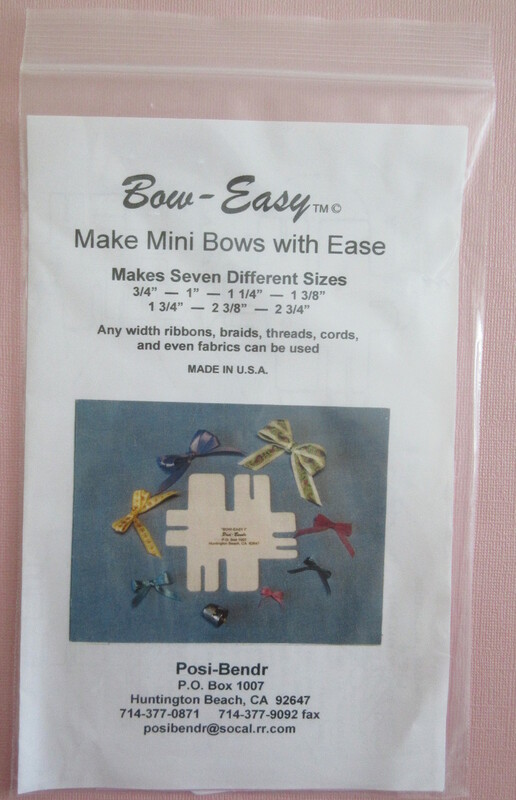 At £6 per set of eight stitched dies you really can't go wrong - they also do a square set, err, which also happened to fall into my shopping basket (plus the same for the Playground toy box of course)! The stitching doesn't show up very well in the photo against the dark blue, but in real life it adds 'that certain something' to the card :) Thanks SaRn for being such a great enabler! ..........just when I find one decorating a cocktail! I'm Diane (Di to most people), retired and I live in Hampshire, UK. 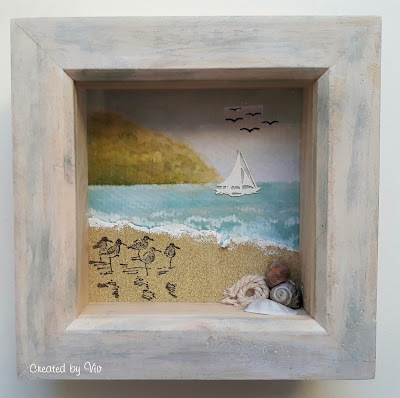 The name Pixie's Crafty Workshop came about because my 'in-house critic' refers to 'The pixie being hard at work' whenever I'm playing with paper or other crafty stuff. And he's right, it's mostly when I should be doing other things :) I've always loved paper crafting - especially using scissors. Aged five and laid up with measles, in a fit of boredom I chopped my fringe right off! If it can be trimmed, then I'll trim it! I hope you like what you see here, and I would be delighted to see you picking up some ideas. However, please don't directly copy my designs for publication or contest submission.Thanks! Copyright. Designed by Loll Thompson - 2016. Powered by Blogger.